It’s that time again, Pint Jockeys… tasting time! We’re back for another monthly tasting event this Thursday, September 19th from 5-7 p.m. with a lineup that features the tastes of fall. Attendees at each of Del Papa’s distribution centers (addresses below) will sample a line-up of fall seasonal beers and ciders from Goose Island, Karbach Brewing Company, Shock Top, Cornel’s Brewing Company, Sierra Nevada and Woodchuck Hard Cider. Each selection is sure to have you excited for the changing of the seasons! All tastings are free and open to adults ages 21 and older. Read on to learn more about each drink on Thursday’s roster! 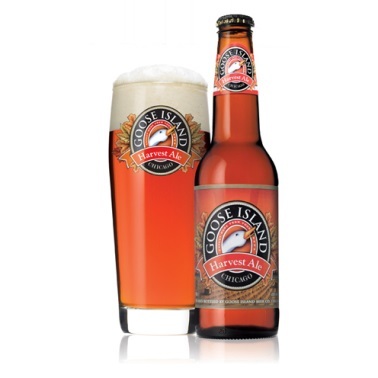 Goose Island Harvest Ale – This traditional American Extra Special Bitter or “ESB” incorporates fresh-picked cascade hops from Washington with rich, Midwestern malts. The ale pours a dark amber hue with caramel flavors, a toasty malt character and fruity, citrusy aromas. Cornel’s Pecan Pie – Reminisce about your grandmother’s famous pecan pie with this fantastic ale from Cornel’s Brewing Company. 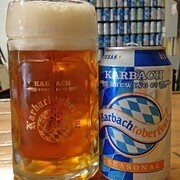 The brew is made using a Scottish 80 shillings-style recipe, and brewed with pecans and Karo syrup to achieve its truly unique flavor profile. Sierra Nevada Flipside – This Red IPA is the perfect beer for the final flash of summer. Featuring a ruby-red hue and loads of tropical fruit and citrus hop flavors, this brew takes you from summer to fall almost seamlessly with just the right balance of sweet and earthy flavors. 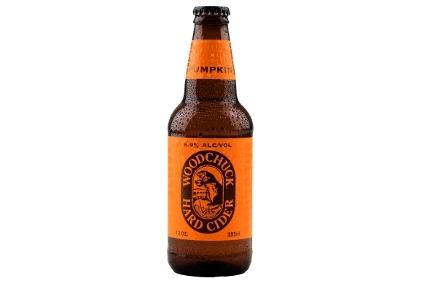 Woodchuck Special Reserve Pumpkin – The world’s first ever pumpkin hard cider, this one is a real treat. The cider is handcrafted using centuries-old cider-making techniques with fresh and crisp pumpkin at the finish. It is naturally gluten-free and pairs nicely with many distinguished holiday dishes including roasted duck, turkey, crème brulee and squash ravioli. We’ll see you Thursday, Pint Jockeys! It’s almost that time, Pint Jockeys! Your September tasting event is set for next Thursday, September 19th and today we’re bringing you a preview of what’s to come. This month’s tasting is all about celebrating the tastes of fall, and Shock Top’s Pumpkin Wheat Ale certainly fits the bill. 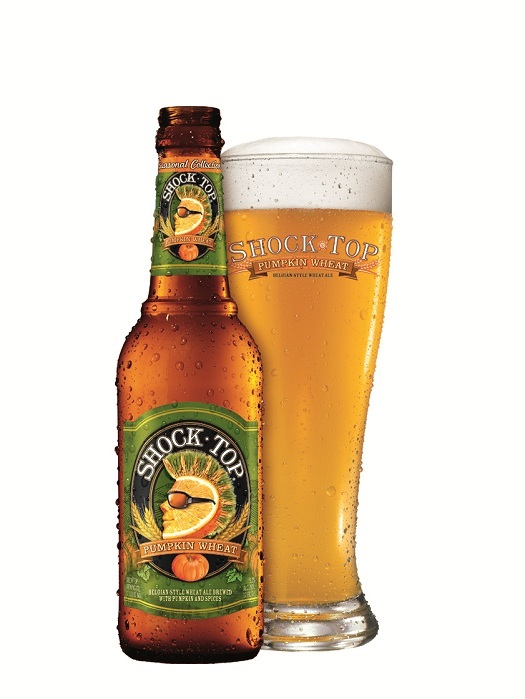 Shock Top starts with a traditional Belgian-style wheat ale and then brews it with ripe pumpkins and a variety of autumnal spices including nutmeg, cinnamon and cloves to create this refreshingly smooth beer. In classic wheat style, this beer pours relatively hazy with a cloudy, deep amber-orange hue. It tops off with a moderately maintained off-white foam and a think skim of bubbles below the lacing. The aromas are representative of fall at its finest; clove, cinnamon, nutmeg and allspice are all here. The taste is full of spice, with some mildly sweet caramels present alongside soft wheat and grainy pale malt flavors. While it is a light-bodied beer, there’s just enough malt in there to support the spice and pumpkin profile which works nicely with the relatively high carbonation. This is one of those beers that truly gets you excited for the upcoming fall and holiday seasons. We hope you’ll enjoy it at next week’s tasting, alongside five other fall seasonal beers and ciders. Check back on the blog next Tuesday, when we’ll reveal the full lineup. Our Facebook page is also full of Pint Jockeys and craft beer news and other goodness that you don’t want to miss. Cheers to Texas Tuesday and cheers to you, Pint Jockeys. See you next week! Welcome back, Pint Jockeys! How did the long weekend treat you? 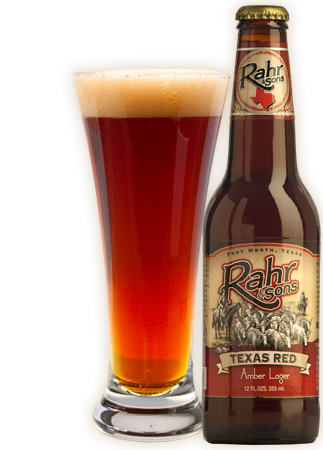 As we say goodbye to summer and look forward to fall, let’s discuss one fantastic craft beer from the fine folks at Rahr & Sons that should definitely be on your radar – Rahr & Sons Texas Red. According to Rahr & Sons, there aren’t any tall tales about how the brew got its name, but it doesn’t need any funny anecdotes to stand alone as one of the most well-balanced beers on their roster. With notes of caramel, light malt sweetness and spicy hops, this super-smooth, highly drinkable beer is a consistent Rahr & Sons favorite. It pours rich, amber hue and forms quite the impressive vanilla-white head. As aroma goes, you’ll smell a nice malt forward nose balanced with a slight hop backend. The malt profile of the beer is upfront on the palate, but followed by sour and bitter tastes. Those subside to reveal caramel and cinnamon flavors to create a delicious finish. The brewery swears that this brew is best enjoyed with your favorite pizza but also suggests pairing it with Cajun, Caribbean, Thai or Indian foods. Making tonight a classic beer and cheese night? Sip this alongside a nice slice of Monterrey Jack or Gruyere. Now that’s a versatile beer! Go forth and check this fantastic Texas-made craft beer, Pint Jockeys. Even better, grab a few six packs and save some for your tailgate’s cooler this weekend. By the way, have we mentioned how excited we are for the start of football season? Ecstatic is the word. Here’s to the delicious start of the fall season – cheers until next week!